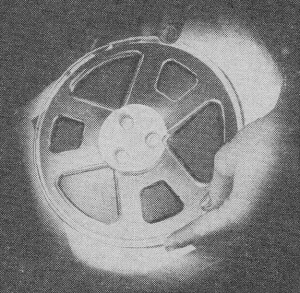 Magnetic tape was the recording medium de rigueur for more than half a century, after the era of wax and wire and before the era of magnetic and optical disks. In fact, magnetic tape is still the storage medium of choice when analog signals must be stored without first being digitized. The public's enthusiastic and ready acceptance of tape recording has rather overshadowed the "miraculous" quality of this new medium. We all, more or less, take our tape machines and recording tape for granted. A lot of time, money, research, and engineering ingenuity goes into each reel of tape you so casually purchase over the counter. 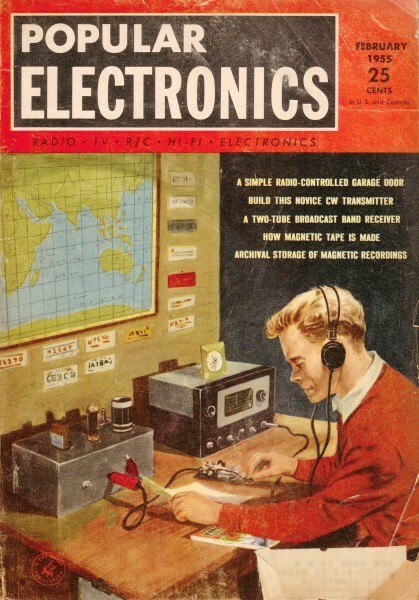 As an example of the painstaking care lavished on this product, the manufacturing operation of OR Radio Industries Inc. is pictured on these pages. 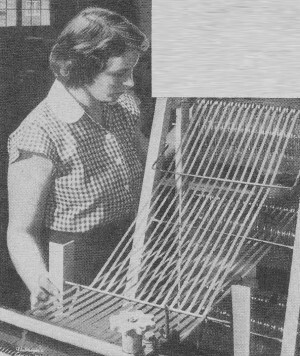 This firm, which makes the "Irish" brand magnetic tape line, is primarily a tape maker so its operation will be described. Research and development play an important part in the operations of most electronic firms and the tape industry is no exception. Continuing efforts are made to improve the product and one such operation is the experimental formulation for dispersion in a laboratory scale grinding mill. 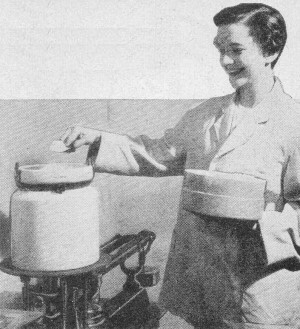 When the laboratory has OKed a new formula or procedure, the technique is incorporated in the manufacturing process. Mass production of the magnetic coating lacquer is accomplished by huge grinding mills which are capable of delivering 500 gallons of coating. A slow and continuous grinding results in a uniform dispersion of the iron oxide particles in the lacquer type base. Special wetting agents and highly effective lubricants are incorporated during the grinding process. Huge batches of the magnetic coating lacquer are mixed in 500 gallon mills like this one. 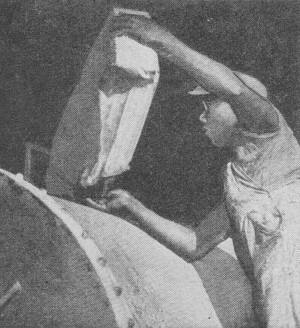 A laboratory technician prepares an experimental formulation in a laboratory grinding mill. The precision coating of the magnetic lacquer on the plastic film is the most delicate operation in the manufacture of magnetic tape. 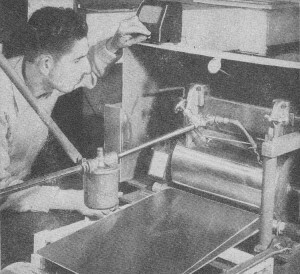 The coating machinery required for this operation is manufactured to watchmaker tolerances. The company's tape is coated to a tolerance of a half of 1/10,000 of an inch since a variation of less than 1/10,000 of an inch in thickness may vary the amplitude of the audio output as much as one decibel. The next step in the operation is the production of 1/4" tapes from coated rolls. This is done by the slitter operator who cuts the 12" coated rolls into 1/4" tapes and winds it on 1200 foot reels, the standard 7" reel of the industry. 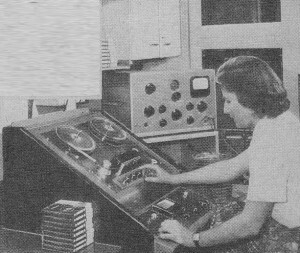 After the tape is wound on the reels, it is subjected to a thorough audio analysis. Professional recording and test equipment is used for this operation. The tape is tested for frequency response, amplitude variation, signal output, and noise level. The final step in the manufacturing process before shipment to distributors is the careful visual inspection of the tape. This inspection is made under fluorescent lighting with the operator checking for inconsistencies in the winding and slitting of the tape and for fractures and molding imperfections in the reel. The next time you casually pop a reel of tape on your recorder, stop just a second and consider the "little miracle" you hold in your hand. The tape coating operation is extremely critical. It is performed on precision machines. Producing 1/4" tapes from the large coated rolls is a responsibility of slitter operator. A thorough audio analysis is made on each production run of the tape made by factory. skilled operators who use fluorescent lighting boxes.